Snowy plovers often flock in numbers on some of the beaches near Santa Barbara. Sometimes it's hard to believe they are endangered. But they literally build their nests on sand: they rely on camoflage, and rapid and prolific reproduction, to protect their young from predators. Seagulls, skunks, and racoons all enjoy a snack of plover chicks, and beachgoing humans and their dogs carelessly destroy their nests too. 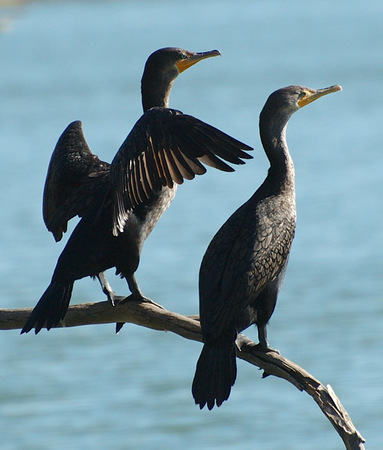 These 2 cormorants were resting and drying their feathers after flying a mission over the Santa Barbara Channel. Their beaks are wickedly sharp, and their feathers look like scales. They look like reptiles, and in fact are pratically dinosaurs. The green eyes make them look like they're wearing contacts or goggles; are they for vision underwater? 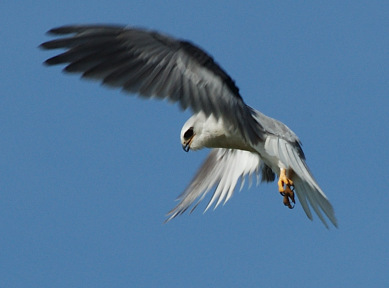 Black-shouldered kites flutter their wings to hang in the air; indefinitely, it seems! Their talons show the purpose of that hovering. 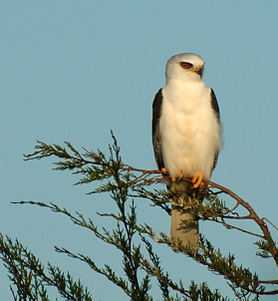 A black-shouldered kite rests briefly while hunting. These fierce birds hover by fluttering their wings, while watching for prey on the ground. Then they relax their wings and swoop off to the next gopher hole. They inspect spot after spot, occasionally dropping silently with wings flared; I haven't seen them rising with seized prey afterward, however. They usually hunt in pairs, not working together but within sight of a close friend. Snowy egrets have a lot of character. Their faces look very serene. 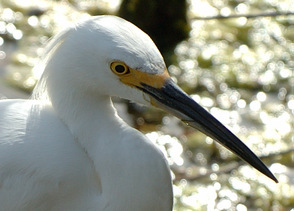 Snowy egrets have large yellow feet that make them look as if they are wearing rubber overshoes. They use them to stir up tasty morsels from the bottom as they wade through shallow water. This egret is wearing breeding plumage of fine white features trailing from wings, tail,and neck. 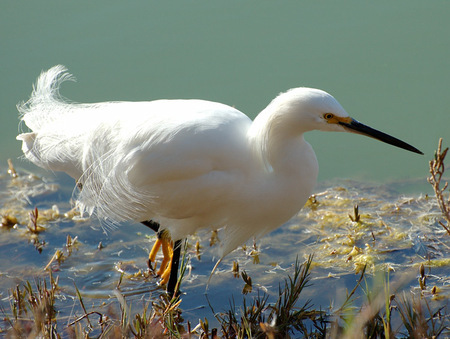 It's easy to see why egret feathers were once all the rage in European fashion, and worth their weight in gold. 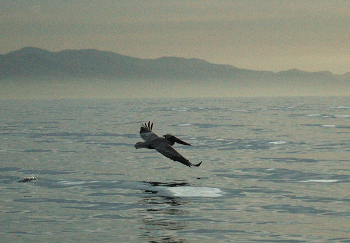 A brown pelican skims along the glassy ocean just after dawn one morning, with the hills of Santa Cruz Island in the background. The lack of wind in the early morning must make fish beneath the surface easier to see. Only brown pelicans execute a wheeling turn, follwed by a vertical dive into the ocean with beak and body stretched into an arrow. 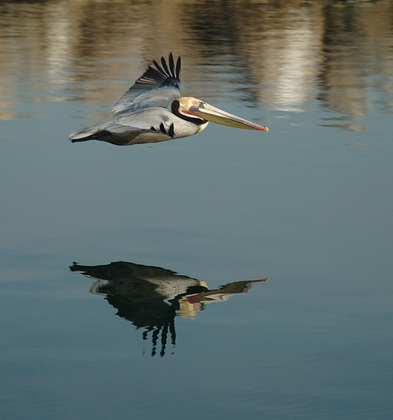 Pelicans would probably benefit from polarized sunglasses, to cut glare from the ocean surface. 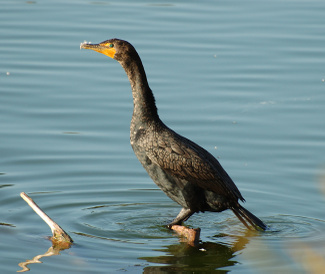 Cormorants spend a lot of time grooming their feathers, so maybe it's not too surprising that they often have downy moustaches. Pelicans look very stable in flight, with their beak and feet folded away. Perhaps they are Swiss Army knives of birds, tough and good at their different tasks, but not especially elegant. This brown pelican was shifting to a different spot in Santa Barbara Harbor. They seem plentiful, although they are just coming back from endangered status. 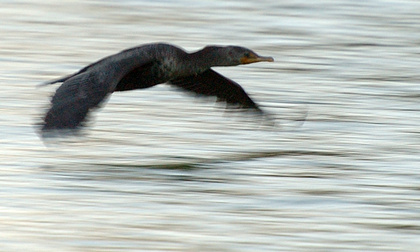 Cormorants like to fly just over the water's surface, maybe because it's easier. They push down on the air to stay aloft, and the water holds it up from below. They are among the few animals that are at home on land, in the air, or underwater.